The End of Year Performance is a wonderful way to celebrate the end of the school year with our families. It will take place in the auditorium for all grade levels. The schedule of the performances will be emailed to you in a couple of weeks. All students should enter through the reception and proceed to their classrooms to get ready. Please sign-in your child inside his/her classroom. First show: GS, MS and PS: arrive at 8:30 a.m.
Second show: CP and CE1: arrive at 9:30 a.m.
Third show: CE2, CM1 and CM2: arrive at 10:30 a.m.
PS through CE1: Students should be signed out by their parents inside their classroom, before leaving after the end of their show. CE2 through CM2: Students should be signed out by their parents at the reception desk before leaving after the end of their show. This year our after performance community gathering has moved off campus. Blaze Pizza has generously offered to host a community/spirit lunch at their Lakeline Commons location at 14009 N. Research Blvd. Austin, TX 78717 from 11 am to 3 pm. All AIS families are encouraged to attend. 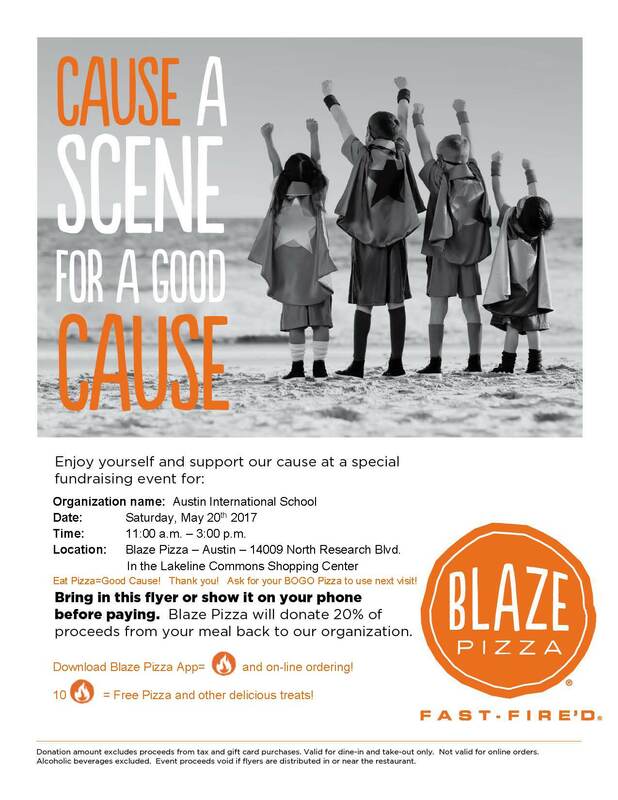 Blaze Pizza will donate 20% of all sales from anyone presenting an AIS paper flyer or on phone. This is a great way we can celebrate the wonderful performances, have fun as a community, and your lunch purchases will turn into an easy way to support the school.